Your Bright Home Cleaning Services is Chicago’s top rated Cleaning Company. Our team of cleaning professionals are fully trained and certified to provide the consumer with a wide range of services that can be customized to meet the specific needs of every customer. YBH cleaning services stands by our commitment to providing you with the most comprehensive cleaning service on the market today. We offer competitive rates and exceptional quality to ensure that you get great value for your dollar. We are fully insured and bonded and we are backed by our A+ rating with the Better Business Bureau. Just read some of our Yelp reviews! A disorganized and messy home takes over your living space and can add to your already stressful life. The professionals at YBH cleaning Services offer you a great release from the pressure of your cleaning chores and help organize your living environment. Our Maid Services provides you with a well-trained, certified maid to handle the task. We clean and sanitize your bathrooms, kitchen, living area and so much more. We understand how difficult it is to allow a stranger into your home, but rest assured that our courteous staff will take special care of your property and belongings and ensure that your individual cleaning needs are met. Our comprehensive cleaning service is reasonably priced and includes all the necessary cleaning products. If you lead a busy life and are renting an apartment, YBH Cleaning Services has a solution to help free up your time, so that you can concentrate on the more important aspects of your life. Our Apartment Cleaning Services is designed with the renter in mind. Our team of certified cleaning professionals will ensure that your apartment is clean and sanitized after each and every visit. If you are in the process of moving out of your rented apartment we can provide you with the deep cleaning required at the end of your lease so you can get your security deposit back. We offer peace of mind to the property owners because they see that you are taking good care of your home and that you are protecting their investment. Whether you own a small apartment building or a suite of offices, you must ensure that the common areas and the bathrooms are well cleaned and maintained to the highest of standards. YBH Cleaning Services offers a comprehensive Building Cleaning Service that takes the worry out of cleaning your property. Our certified cleaning staff will work hard to help preserve your investment by scheduling regular visits that are tailored according to your specific needs. The tenants will be impressed with the fact that you take such good care of your property and this will help encourage them to stay. An added benefit is the fact that you won’t need to hire an in house cleaner, so you can better control your bottom line and keep more money in your pocket . Cleaning a High-Rise building is no easy task because of the complexities involved, so it is best left to professionals. 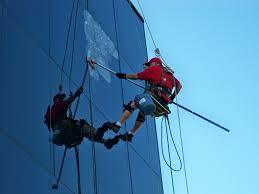 YBH cleaning services offers a cost effective solution for your High-Rise cleaning needs. Our cleaning team is certified, insured and bonded to ensure that you receive a high quality service delivered by trustworthy staff. We know that every project we work on is unique, so we help you create an individual cleaning plan that is designed for your specific needs. If you have a short term cleaning project and are short staffed, we can offer you a qualified team to help take the pressure off. We are courteous and punctual, and we strive for the highest of customer satisfaction. The pride of owning a condo does come with certain responsibilities. You are required to maintain your property to the standards that are laid out by the home owners association. Your HOA fees take care of the common areas and the grounds maintenance, but never address the inside of your condo. The experts at YBH Cleaning Services know the value of keeping a clean living area and that is why we offer our Condo Cleaning Service to our valued customers. Our attention to detail will ensure that your condo’s interior remains as clean and pristine as the day you moved in. If you are away on business or on a vacation, our cleaning staff will continue to keep your home in great condition, and we’ll even water your plants for you. We are honest and trustworthy with many years of experience in the industry. Our dorm Cleaning Service is tailor made to suit the active life of a College student. We understand that cleaning chores may not be the top priority for every student, so our company not only delivers a comprehensive cleaning package, but it provides the parents or guardians the peace of mind of knowing that their children are living in a clean and healthy environment. A clean and well organized dorm helps increase their productivity and delivers a sense of comfort in knowing that someone cares about them. The team at YBH Cleaning Services will work around the busy schedule of the student to ensure that we don’t affect their studies. Trust us to provide your student with a great service that goes beyond cleaning to give them the feeling of a clean home, away from home.